The gray catbird, Dumetella carolinensis, is a member of the Mimidae, or mimic, family. The mockingbird & the brown thrasher are also in this family. Gray catbirds have been known to imitate calls of as many as thirty five other bird calls, and an occasional tree frog. Research has shown that their repertoire of songs increases with age. The mockingbird repeats each phrase it sings three times, the brown thrasher repeats each phrase twice, and the gray catbird repeats each phrase only once. It is easiest to identify by its ‘mewing’ type call. It is considered a gifted vocalist and has five to seven pairs of syrinx muscles. The syrinx muscles are a bird’s sound box. The sound box is an enlargement of the trachea at the point where the windpipe divides into two bronchi. The syrinx is exclusive to birds. It is a cartilaginous chamber with elastic membranes that are controlled by muscles that very with tension and position according to the passage of air across them. The syrinx has two parts and can produce two distinct, yet similar, songs at the same time. The two parts can also be used together to make a single song. Gifted vocalists like the gray catbird have many pairs of syrinx, while a pigeon has only one pair, and a turkey vulture has none. 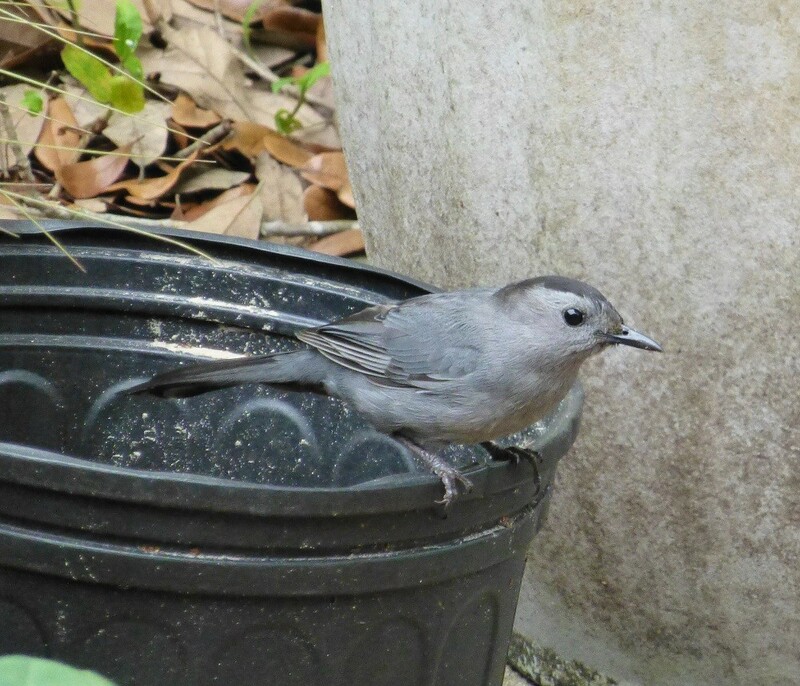 The gray cat bird is approximately nine inches in length with identifying features that include gray plumage, black head cap, rusty crissum (the feathers surrounding the cloaca), tail flicking habit, and mewing call. The male and female look alike and give the same mewing call. The average life span is two to three years. They are commonly seen in our area of Central Florida in the fall, winter and spring – rarely in the summer. 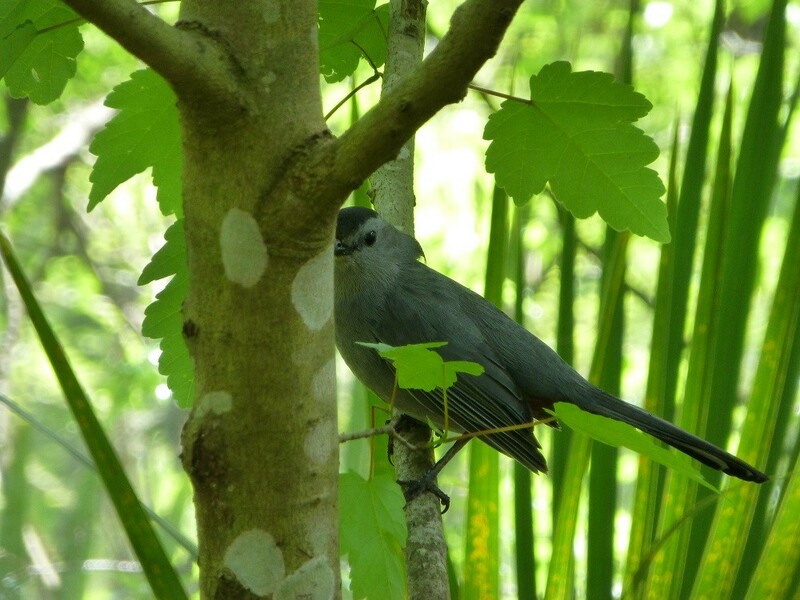 Catbirds forage on the ground and in tree & shrub foliage. Their diet consists of 50% animal and 50% plant material. They consume ants, spiders, caterpillars, grasshoppers, beetles, and relish blackberries, elderberries, cherries, grapes, and many other fruits. Much of their fruit diet is governed by seasonal availability. Their love of fruit makes them one of our leading frugivores. The southern breeding limit in Florida is Gainesville. Their nesting preferences are wetland thickets with especially dense foliage. The nest is bulky and unkempt looking and resembles that of a cardinal nest. It consists of leaves, twigs, weed stalks, grapevine bark, pine needles, horsehair and paper. The cup is lined with fine rootlets. It is generally two to ten feet off of the ground. Four to six blue-green eggs are laid, and incubated approximately twelve days by the female. The male feeds the female and guards the nest from predators during this time. Once the young hatch the parents feed them insects and fruit, and they fledge (or leave the nest) at ten days.